Conglomerate is geometric versatile font family designed by Gregory Shutters and published by Typetanic Fonts, a personal type foundry and lettering studio from Chicago, IL, USA. Featuring a clean blend of typographic antagonists like sans vs. serif, square vs. rounded and calligraphic vs. geometric, Conglomerate include small caps, proportional, tabular, case-sensitive punctuation, ligatures, fractions and also ordinal indicators. 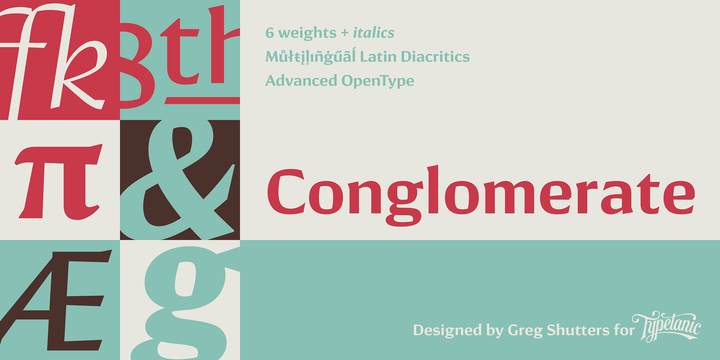 Get versatile legibility in text with Conglomerate ! A font description published on Friday, April 8th, 2016 in Fonts, Gregory Shutters, Typetanic by Andrei that has 2,223 views.